1. It's a quick, easy way to find photos to use legally. There's no quicker way to find a photo to use (legally) for your project than doing a search on Flickr or WikiMedia Commons, finding an image you like, checking to see if the license is appropriate for your use, and then applying it to your website or project with the appropriate credit. This can all be accomplished in 5-10 minutes once you know what you're doing. This is far and away the number one reason people elect to use CC content. There is no cost associated with it, even for works that are marked for commercial use. 1. Only about 1/3 of CC licensed photos are marked for commercial use. This is obviously only a problem if you are looking for photos to use commercially. Keep in mind, though, that "commercial use" is very broad, and doesn't just have to be in an ad or placed prominently on a business' website. Even using a CC work on a website with ads on it is considered by some to be commercial use. If you think there's any chance the creator of the work would see your use as commercial, it's best to use only works marked for commercial use, or to seek further clarification and/or permission from the content creator before using the work. 2. Photographers don't always understand the terms of the license. While this isn't the image user's problem per se, it's certainly not pleasant to have to deal with if a photographer is unhappy with the way an image is being used, even if it is within the scope of the license. If you find a photo that is marked with a CC license, but that has conflicting information next to it (e.g. All Rights Reserved, or please contact before using), it's probably best to use another photo. The photographer already agreed to a license he or she obviously didn't read, so you're likely to run into some trouble down the line. 3. You may end up infringing even if you do everything right. This doesn't seem possible, but legally, it actually is. Sometimes content creators mark other people's photos as CC. You may find a photo available to be licensed under CC, use it on your website, and then find out that the person who marked it was not the original photographer. This places some legal liability on you, even though you were led to believe the image was legal to use. If something seems fishy about a photo (it's only available in very small sizes, is very grainy, no metadata is available), don't use it. Above, a properly attributed CC photo. While the pros and cons of using CC are fairly cut and dry for image users, things get a little more complicated for photographers. 1. It's a way to reach a broader audience. If you're just starting out in photography and are looking for exposure, CC is a great way to get that. You may find you work showing up on blogs and sites that never would have contacted you, and in turn, potentially see some traffic to your website. 2. You can control the amount of rights you give away. There are several CC licenses that allow you to tailor how much freedom you give to image users. You can decide if you want to allow the work to be used commercially or not, whether or not users can alter the photo or not before sharing it, and under what terms users can share the photo. 3. You can offer several images under CC to gain exposure, but keep the rest of your portfolio more restrictive. You don't have to mark your whole portfolio as CC. You might try it out with a few photos, or photos you don't plan to sell, to see how it works. 4. If you're a heavy user of CC-licensed photos, it's a way to give back to the community. 5. 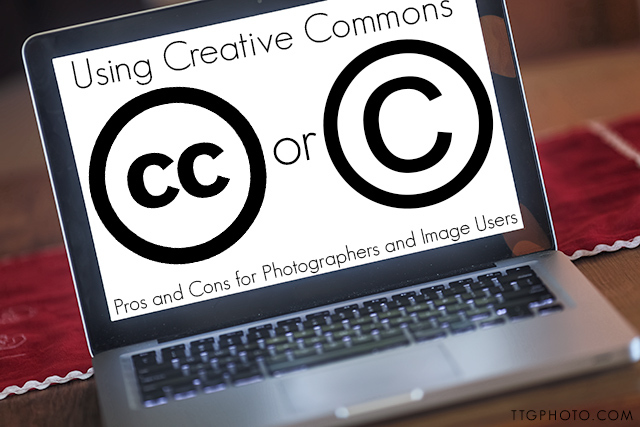 More people will use CC licensed photos than seek permission to use non-CC photos. Users that know about CC are more likely to just do a CC search for a photo, especially if they are in a hurry, than to bother to seek permission to use a copyrighted photo. Most image users do not take the time to actually read the licenses. A lot of folks assume that CC is equivalent to public domain, and do not understand that credit must be given. More than once I have had a business use my photo, not credit me, and then say "it was a CC photo" in defense. The backbone of CC is giving attribution! Additionally, when users do give attribution, it's often done incorrectly (e.g. "photo credit: Creative Commons" or "photo via Flickr" instead of the photographer's name). If you're an image user, please read this article on best practices for attribution. You may find your photo used in a way that you aren't comfortable with, but if it's within the scope of the license, there's nothing you can do about it. You can't ask the user to take it down if they credited you properly (see below). You have to be comfortable with the idea that virtually anyone could use your photo, and you do not get final approval before it is used. 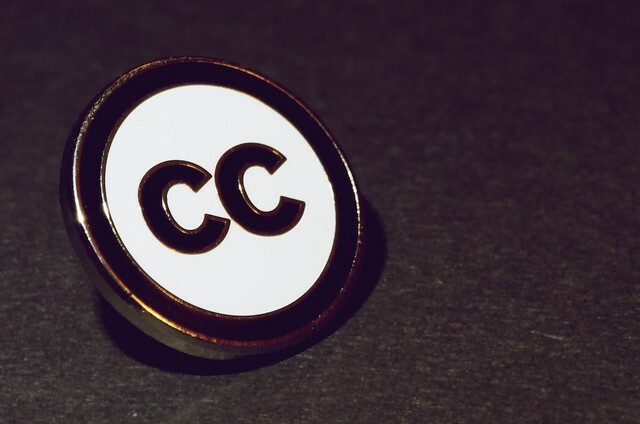 You can choose to stop distributing your work under the CC designation, but legally, you cannot revoke the license. A CC license is permanent, so you must think carefully before applying it. If you're hoping that allowing your images to be used for free will at some point bring you paid work, you may be disappointed. Only a small percentage of readers will actually click on the attribution link (and remember, the majority of photos are not attributed or are attributed incorrectly). Of those that do click the link, they are usually being brought to the image's page on Flickr (or an equivalent page), not your portfolio. It takes a lot of clicking around before someone is going to end up on your portfolio contacting you for paid work. I'm not saying it won't ever happen, but it's not the gold mine you might think it is. 5. You worked hard on your photos, and you deserve payment for them! Some people feel that they should be able to use photos for free if they aren't making money off them. In that same vein, I should be able to watch a movie on Netflix for free as long as I don't sell it. The bottom line is, if someone wants to use a photo, it's probably because a lot of time, talent, effort, and, yes, money, went into making it. A photographer has every right to request compensation for the use of a photo, even if it is non-commercial. I am neither advocating for or discouraging the use of Creative Commons. I no longer mark my work under CC, for many of the cons listed above. That said, I think CC is a wonderful organization for content creators and users alike, and it's just a shame that more people don't use it correctly. Whether you're a photographer, a blogger, or a business owner, I hope this has shed some light on the many misconceptions surrounding CC.